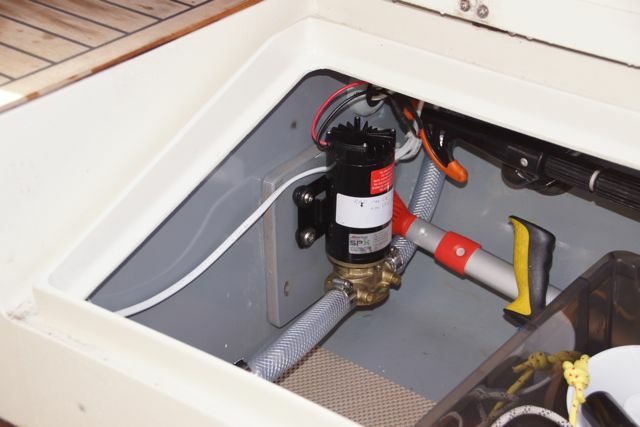 Choice of equipment: At the Southampton Boat Show (2014) I told Matt that the worst thing about Seatern was the Whale Gulper 220 ballast pump! I mentioned the idea of installing a submersible automatic Bilge Pump and it seemed he had been thinking along the same lines. However on the TCS stand I met a Jabsco representative (who market the Rule pumps) and he said a submersible pump would not stand up to constant submersion. 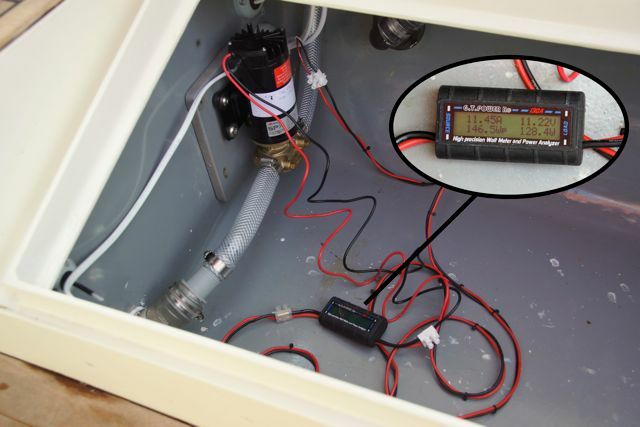 He recommended a Jabsco Wakeboard Towboat Ballast Pump (part no. 18220-1123 where the second number varies according to the impeller materials). Apparently boats used for wakeboarding have ballast tanks which are filled or emptied in order to shape the wake formed by the boat. The pump is therefore reversible and will fill or empty the tank. Matt offered to buy me a pump if I would fit it and report on its performance. However he preferred to buy a Johnson Flexible Impeller Ultra Ballast Pump (F4B-11) since it was available from a distributor he uses. The specs for the pumps are similar except the Jabsco one is claimed to have run dry protection. At a lift of 1m (about 0.1 bar) it is rated at 50 litres/min (compared to the Rule 20R at 39 l/min or the Whale at 15 l/min). Filling took 5.8 minutes to the hatch level, then a 10 minute wait while the forward tank caught up, followed by 2 minutes top up. Total power was 1.53Ah, average amps 11.7, peak amps just over 15A (needs 20A fuse and decent wires, I’m using 2.5mm tinned). Emptying took 5 minutes to drain aft tank, then ( in order to empty forward tank) a number of short pumps and pauses – total time 26 minutes (of which 11.4 was pumping), total power was 1.8Ah, average amps was 8.8A, peak amps about 12A. For emptying the performance and power consumption is similar to the Rule submersible pump I’ve been using – but without the hassle of setting it up each time. For both the wakeboard and Rule pumps the time to empty is determined by the rate the forward tank drains aft; the Whale was slower, taking at a guess 45 minutes or more – I never waited to find out! So the great improvement over the Whale is much less time with the tank partially full with lots of water that could be potentially destabilising, and significantly less power consumption (I estimate the Whale would take about 5Ah – over 3 times more). 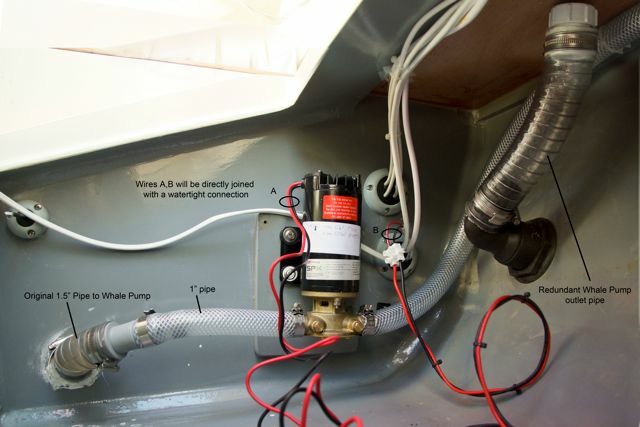 For filling I prefer the pump to the self bailer which tended to be hard to open and close (probably because Seatern dries out on the mud and grit gets in the bailer, I’ve avoided bailers in my racing dinghies for a similar reason). In winter it will be far better than having to reach through icy water in the full tank to close the bailer! In fact, I’d be tempted to seal the bailer up, but I guess it provides a safety backup should the pump fail when the tanks are empty. The only downside is that the new pump is as noisy or noisier than the Whale – but it is working for very much less time. 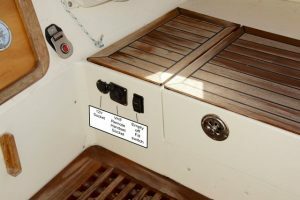 Being able to fill or empty the ballast tanks at the flick of two switches (the one in the cabin prevents accidental operation) seems a great improvement. It is still necessary to open the cockpit hatch both to monitor the process and also to allow air in/out of the tank.